The Magician: “The Magician challenges us not to be deceived by the transient, material world. He shows us that life is a magical act, and our mind the magician. He is a showman, a mysterious stranger who captivates the crowd by sleight of hand, as well as by real magic, reminding us that the mind can be deceived by delusions of spiritual grandeur masquerading as the real thing. On The Magician’s magical, floating table is an array of objects symbolizing the mental clutter that prevents us from self exploration. However, his magic wand, pointing both “above and below” – the occult expression of the unity of Heaven and Earth – hints that he can make the objects vanish. 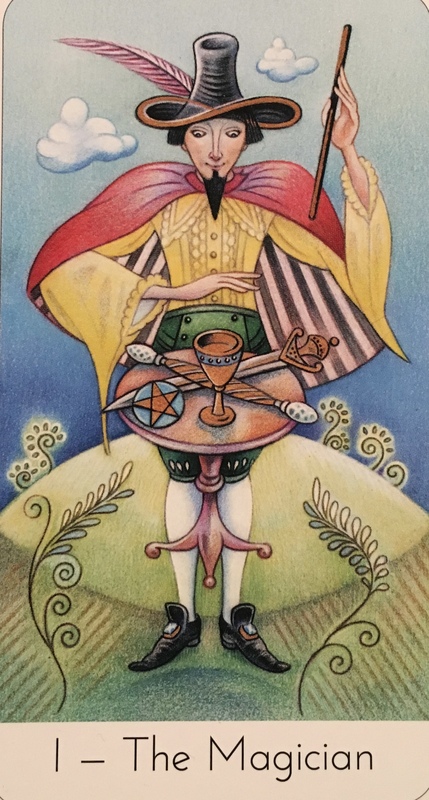 The Magician’s number is one, the symbol of a new beginning, and the brim of his hat forms a figure of eight, the symbol of infinity and the eternal cycle of life. Do not get sucked into the drama playing out on every television, every radio station, every internet news report and at least half of social media right now. Yes, we all know what is going on. No, we don’t agree with most of it. But how do we refuse to live in fear and doubt and find peace in the eye of the storm? We look for the magic within. And we make sustainable choices for our own lives. We choose to make a difference. Our whole existence is being reconfigured, one person at a time. Starting with you. Reading this right now. You, finding the magic and power within You. Trusting in it. Stepping into it fully. Refusing anything less. Releasing all the fears, all the doubts, all the should haves and could haves, and stepping into a much more powerful Now. Finding within you all the wisdom, all the strength, everything you ever looked for outside. Awaken to how important you are to the collective. Realize that everything else is just smoke and mirrors; illusions that can disappear instantaneously. At once you realize that you are the magician. That you are Infinite. That you are wise. That you are capable of manifesting whatever you put your mind to; focus your intentions on. That you always were, you just forgot, and now, finally, again you remember. You can create the necessary change. You can make the difference. As above; so below. The magician seeks to heal himself, then the Great Mother Earth he stands upon. Creating a brand new world.